The knee is a complex joint made up of different structures including bones, tendons, ligaments and muscles that work together to maintain normal function and provide stability to the knee during movement. Movement of the bones in a joint causes friction between the articulating surfaces. To reduce this friction, all articulating surfaces involved in movement are covered with a white, shiny, slippery layer called articular cartilage. The articulating surface of the femoral condyles, tibial plateaus and the back of the patella are covered with this cartilage. The cartilage provides a smooth surface that facilitates easy movement. 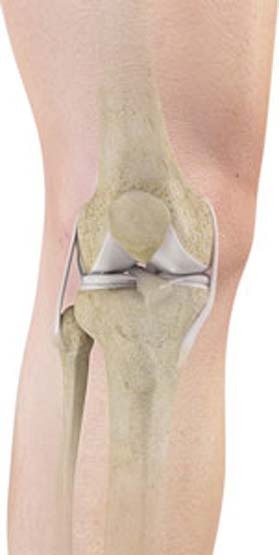 Within the knee joint between the femur and tibia are two C shaped cartilaginous structures called menisci. Menisci function to provide stability to the knee by spreading the weight of the upper body across the whole surface of the tibial plateau. The menisci help in load bearing by preventing the weight from concentrating onto a small area, which could damage the articular cartilage. The menisci also act as a cushion between the femur and tibia by absorbing the shock produced by activities such as walking, running and jumping. Cruciate ligaments are a group of ligaments present inside the knee joint that control the back and forth motion of the knee. The Cruciate ligament in the front of the knee is called anterior cruciate ligament or ACL and the cruciate ligament in the back of the knee is called posterior cruciate ligament or PCL. There are two major muscles of the knee joint, the quadriceps and the hamstrings, which enable movement of the knee joint. The quadriceps muscles are in the front of the thigh. When the quadriceps muscles contract, the knee straightens. The hamstrings are in the back of the thigh. When the hamstring muscles contract, the knee bends. Tendons are structures that attach muscles to bone. The quadriceps muscles of the knee meet just above the patella and attach to it through a tendon called the quadriceps tendon. The patella further attaches to the tibia through a tendon called the patella tendon. The quadriceps muscle, quadriceps tendon and patellar tendon all work together to straighten the knee. Similarly, the hamstring muscles at the back of the leg are attached to the knee joint with the hamstring tendon.